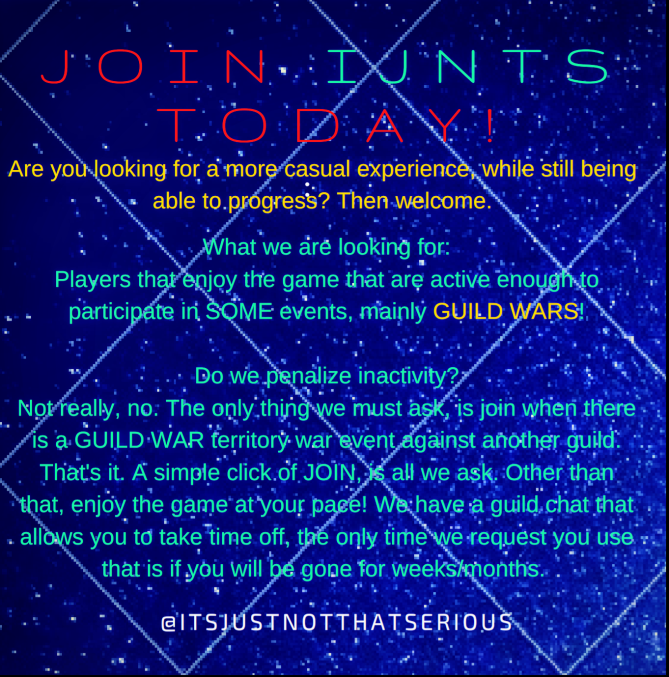 IJNTS are a relaxed, casual guild of players that like to roster build and compete, without things getting silly! Having always had around the 45 active players mark, recently a lot have drifted out of the game so this is a great time to join a guild that will just let you get along with what you want to do – enjoying the game! •	Discord – Yes, encouraged by not mandatory. o	We have only been running Heroic Pit for some time now, usually a few times a week but whenever up. We would consider running lower levels on occasions if new members needed it. o	HAAT is exclusively run, and occurs whenever up – usually once a week. o	Sith Raid – We alternate 4 & 5 whenever up – again, usually a few times a week. o	We are over .500 in all the TWs we have participated in and always put up a good fight. TBs we are usually looking at around 15/13 stars for Light & Dark side respectively. •	Reset is 00:30 UTC. Remember – it’s just not that serious… So if that sounds right for you, look us up and join the fun! PS – Merger with a 10/15 guild would be considered also, and we would look to give an officer place as part of that. Hit us up to chat. Would expect full participation in all guild events, donations flow fast so want to keep it that way, and ticket generation benefits the whole guild. Cupcakes and Unicorns is a laid back guild with a few core members in the 2m GP range. We do Heroic Rancor, and Heroic AAT. We are currently doing 6* Sith. We don't worry about how many Raid Tickets you produce in a day, or even if you disappear for weeks at a time. For guild members that are high enough, we rotate finishing first in Rancor and HAAT so everyone can get the title. We need a few more players preferably above 1.25M GP, the higher the better. Heroic Rancor about every 3-4 days depending on tickets produced. 7PM EST/12PM UTC start time, 24 hr join period, post damage anytime after the join period; normally finished in 8 minutes or so. HAAT about every 4-5 depending on tickets produced. 7PM EST/12PM UTC start time, 24 hr join period, post damage anytime after the join period; normally finished anywhere from 2-14 hours. STR T6 about once a week, starts immediately after the previous finishes. Working towards HSTR. T6 has been a little faster lately with some better teams. TW currently just below 60M GP active participation. We normally win 75%. Looking to break 60M GP with new active players. We would prefer L85 players or close to it with a couple decent teams and a vision towards building HSTR teams (NS 1.0, JTR, Revan, etc.) but not required currently. We are really laid back for the most part and need some daily players with the goal of completing HSTR in the next year. We prefer LINE for guild communication for members, not a requirement, but most of the more serious members use it. 25 members currently. Looking to fill up to improve at guild events. Chat app - Add Shagnasty or GradientBiscuit on LINE mobile app and we will add you to the group. Raids - Sith Raid Tier V, Heroic AAT & Heroic Pit as often as we can. Minimum Requirements - No Minimum level requirements. Happy for new people to join and build themselves up with our help! Be active daily, participate in all guild events and raids to the best of your ability. Any members inactive for 2 weeks or more without notifying us will be removed. If you have any questions, message me on here or message Shagnasty or GradientBiscuit on the LINE mobile app. Just Sithed Myself is Recruiting! We are currently 88 million GP, semi-casual. Life comes first! 6:30 pm CST Raid Start Times. We have a fun group of dedicated players who strive for fun and success! We get 30* LS TB, 32* DS TB, Large TW success rate (over 90%), hPit 30 minutes until solos posts, hAAT 30 minutes until solos Post and T6 STR in 2 refreshes! We constantly surprise opposition, come find out how! Looking for active, friendly, fun new members to fill our ranks! Any GP is fine, we can help guide you. Veterans, we love working together to grow and learn! Hope you find your home! The Guardians of EgoFreezers suchen neue Mitglieder! 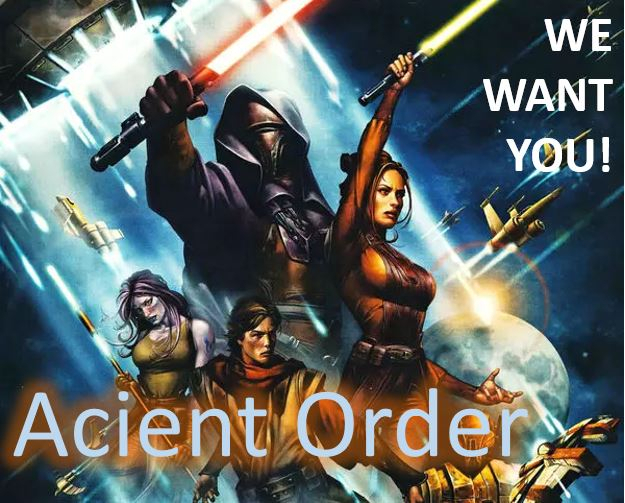 We want you in the Acient Order! At 48/50, looking to fill last two spots. PM me: "Zax_01" (forums); Ally Code: 272-259-942 (in-game); or reply to this post! We need you active in the stuff mentioned above. Strength in Territory Battles is highly preferred. Casual guild looking for new members of any level to up our numbers. Preferably active players but no strict requirements, just play whenever. Looking to get more members so we can do more frequent raids and get that gear. Are you looking for a fun, active, growing guild with a passionate player base, but who still acknowledge that this a game and as such realise it should be enjoyed and won't impose draconian rules on you? Then Bobas Shrimp is the guild for you! ◦	Raids: Heroic Rancor (done in few minutes, 3 times a week); Heroic AAT (done in few hours, 2 times a week), Sith Tier 6 (done in 4 days). We are a very united and active team but not that extremely like others. We have members from many countries; Venezuela, USA, Spain, Brazil, Germany and France. ◦	Player level 80 or higher. ◦	24hrs of 0 damage for HRancor and HAAT. ◦ Sith Raid immediately restart when finished or tickets available. ◦	We kick out members with more than 5 days of inactivity, unless it was previously notified this absence. ◦	Follow few basic and simple instructions for territorial battles and wars. This way we can coordinate our team effort. ◦	We don’t pretend or demand to spend crystals to reach 600 daily tickets (but if you get close or at least 400 this will be appreciated, because that allows us a better frequency of Raids). ◦	We don’t force you to join LINE o DISCORD; but we do have a Whatsapp group chat to coordinate and help each other in a more effective way because with the game chat this matter still a little bit more difficult. However if you want to communicate by game chat only, it’s ok for us. 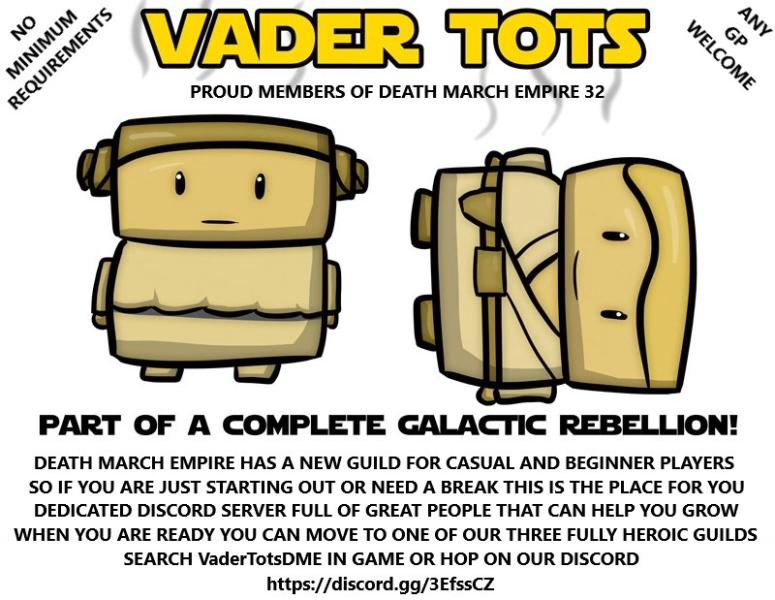 We want to keep developing and growing as guild to reach all Heroic Raids, 48 stars in territorial battles and win all Territorial Wars we participate in! If all above sounds good to you, you can look for us and join since we are open guild option in the game. Hope I can see you soon in our team! we were 190mil as of last week, beating everything except the last dark side TB star. Petzis`s Padawans suchen Verstärkung. Wir sind eine englisch und deutschsprachige Gilde, die in erster Linie Spaß am Spiel haben wollen. Unsere 52 Mio GP starke Gilde spielt den HRancor und HAAT sowie Tickets dafür vorhanden sind (Startzeit ist 19:00), mehrmals die Woche. Den Sithraid probieren wir derzeit auf Level 6, das dauert aber dann ein paar Tage ;-). Wir kämpfen im TW um Zeta Material und gewinnen eigentlich immer. Im TB erzielen wir durchschnittlich 16 Sterne. Es ist jeder willkommen, der das Spiel genauso mag wie wir, ohne es zu ernst zu nehmen (das wahre Leben geht vor ;-). Masters of old Republik braucht Verstärkung. bei 1-2 Tagen offline geht die Welt nicht unter, ab 5 Tage würden wir uns aber über eine Abmeldung freuen (Urlaub, Krank, Arbeit, Privatleben geht immer vor). Wir machen den Rancor auf 7 Sterne (wenn genug "kleine" dabei sind gehen wir auch mal runter), sind kurz vor dem HAAT und sind bei dem STR in der Lage Stufe 6 in ca. 4 Tagen zu rocken. Wir bleiben Chillig, aber hoffen irgendwann mal etwas größer zu werden, deswegen freuen wir uns über jedes Ticket. Wir freuen uns über frischlinge, welchen wir gerne mit Rat und Tat zur Seite stehen, aber auch über Fortgeschrittene und Veteranen für die das Gildenleben manchmal zu stressig ist (wir gehen alle arbeiten oder in die Schule und setzen unsere Prioritäten erst auf Privat, dann auf das Spiel). Wir sind eine coole Truppe mit einem Altersspektrum von 10 bis 35, also es geht bei uns gesittet zu. I took over as guildmaster of Berserker, an original SWGoH guild, back in December. The old guildmaster and a lot of our original players have drifted away from the game. 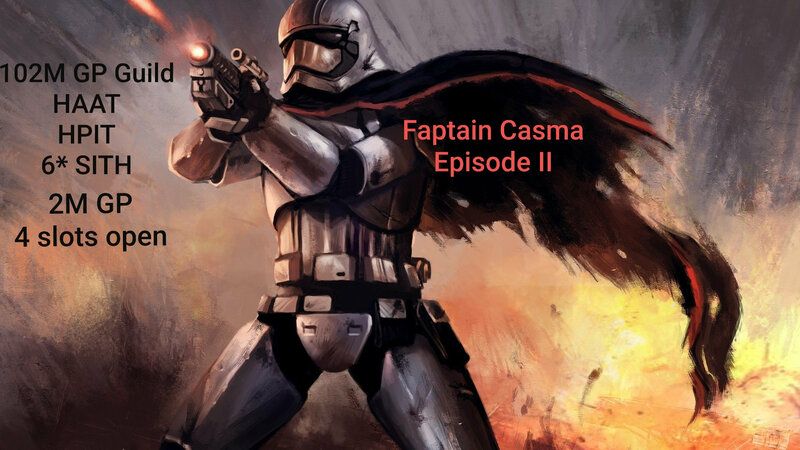 We still have about 25 active, mid-high level players at about 55M Galactic Power, and I'd like to invite any casual players who aren't looking to deal with a lot of rules or newer players who are looking for a group to join and grow with to consider us. We have a number of veteran players to help you on your way, and we don't have any real rules, aside from having fun. We currently complete Heroic Pit and HAAT raids, as well as T5 Sith Raids. Would love to build back up and be able to do heroic Sith Raid, and do well in TW and TB events. 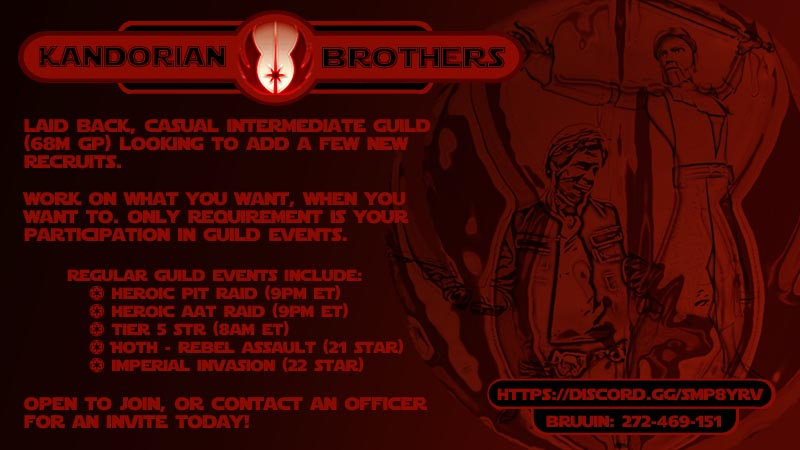 I'd also be open to having another guild in a similar situation merge in with us so we can both get back to critical mass, and would be glad to give officer slots to your existing officers. Let me know if that's of interest. We ask only that you show up put up 500 tickets a day average, have 2.2 mill GP, at least 1 HSR ready team, do all battles in TB, and follow raid rules. We are a very laid back group. LTDLStrikesBack is 105 million GP and looking for active players. 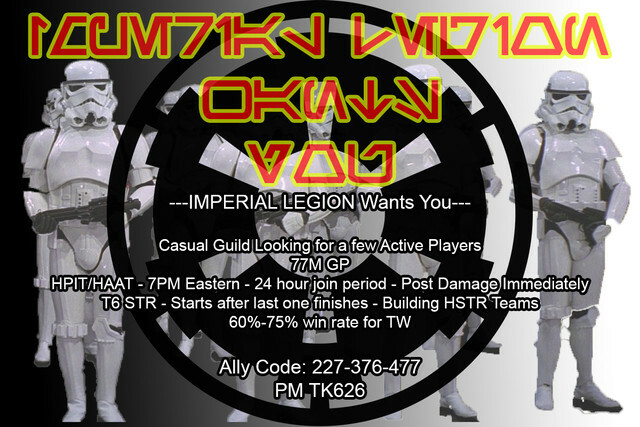 My guild is currently looking for 5-10 new members or a small guild merger. We have HPIT & HAAT on farm and have about 85 mil GP. We are a casual guild working towards heroic Sith. All the Officers are PST but we tend to play at all hours of the day/night. We open the raids at 7pm pst once we have tickets. Then 24 hours later we open it for a free for all. If interested or just want to know more please feel free to DM me or add me as a friend. Knights of the Fallen looking for new members. 2.3 mil average gp. 45 members with 103 mil gp.